In the last few months I have been busy at the easel completing some commissioned paintings for clients who had specific requests. These last two commissioned works however, required a much different approach and one that gave me more creative freedom. 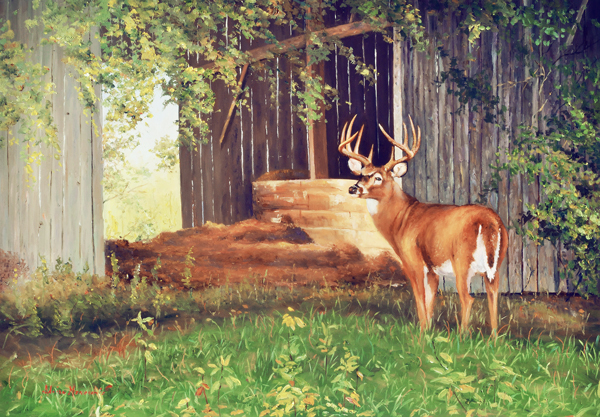 The two requests I had were for a painting of a whitetail buck and one of a church interior similar in concept to an unusual oil I created some years ago titled Power of Light (to view this image scroll down this page http://www.adriano-art.com/?gallery&c=3 ), which has been a favorite with many collectors since. As those were the only requirements, I was able to make the important decision on what scenes to paint, and create compositions that I felt were pleasing and at the same time, dramatic. After the general concepts’ approval from the collectors, I worked on completing the paintings, making small modifications when necessary as I progressed, and didn’t stop until I was very satisfied with the end-results. Of course the last word is always the collectors, so no painting is ever completed without their seal of approval… Fortunately, both clients shared my vision for these paintings and were extremely pleased with the finished paintings. 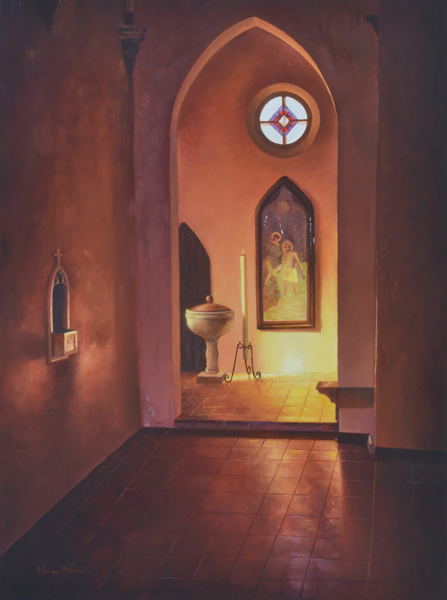 Baptism By Water found its inspiration from the interior of a Capuchin monastery in Italy, constructed in the late fifteen hundreds and today open only on special occasions. Through some personal contacts, we were able to get a private tour of the church on a very hot Summer day. When we walked in, the church was in semidarkness with only a few rays of sun filtering through the small stained glass windows and illuminating otherwise dark corners. The light spilling on the baptismal nave lasted only a few minutes, but it was so dramatic that I knew even then that one day it would become a painting. Aware found its inspiration a lot closer to home. Early mornings on crisp autumn days have always been a favorite time of mine to go out and get material for future paintings. When I came across this distressed barn in one of my wanderings, I was immediately attracted by the wood’s warm tones and overhanging foliage just starting to turn, giving the entire scene a sense of “wilderness”. If you are wondering, the buck was not present while I was there, but very visible tracks were. That gave me the idea of creating a painting that is a little unexpected but highly plausible.